Sigco, Inc., an architectural-metal and glass fabricator in Westbrook, ME, recently went in search of an ergonomic manipulator that would adequately address employee-safety concerns while enhancing productivity by being able to handle a wide variety of products, including large, heavy sheetmetal blanks. The result of its search: acquisition of five pneumatically powered 550-lb.-capacity Famatec Friendly ergonomic manipulators from Haeco, Loveland, OH. The firm once required as many as five employees to handle 500-lb. components; now, one operator using a Famatec Friendly manipulator can perform the task. Further, Tardiff explains that an operator can move product more quickly compared to using a previously employed traditional jib crane, which often resulted in awkward movements and swinging of the product. 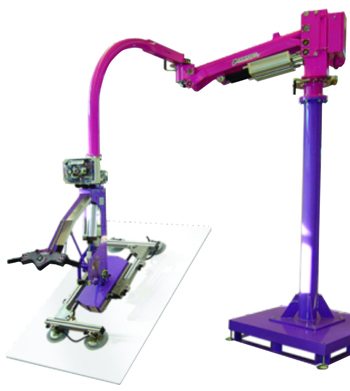 Haeco offers Famatec Friendly manipulators with load capacity to 1100 lb., a working radius to 20 ft., and with a range of mounting options including column, overhead, track, wheeled or with a free-standing fork-truck transportable base.